This past year the City of Hartford completed its Capital City Parks Master Plan that presents a bold and exciting vision for improving our parks and the connections between them. The plans, which can be found here, have been through full public comment periods and they look great. But now we need the city to implement them. Transport Hartford supports implementation of the plan because our parks provide necessary places for city residents and visitors to walk, bike, and play sports. The Parks Master Plan will take a significant amount of funding to complete, but when it is implemented the City of Hartford and its parks will be a better place for residents and an attractive place to visit. We're advocating in particular for implementing the bike routes in the plan. Much of the lane striping and stencils along these routes represent an affordable part of the Parks Plan that can be implemented now as part of the ongoing process of street milling and re-paving. Transport Hartford is advocating for the implementation of the entire plan, with an emphasis on fast-tracking as much of the bike route work between our parks as possible as our streets are re-paved. To get these plans implemented, the City and its elected officials need to hear from you. We know that even a small number of emails can help our representatives know what is important to City residents. Please send a note of support for implementing the Capital City Parks Master Plan and its bike routes to City Council Members and Mayor Pedro Segarra. Let them know that you like the plan, and now you want them to act quickly to implement it. CC transporthartford@gmail.com so we know how many of you have sent emails. 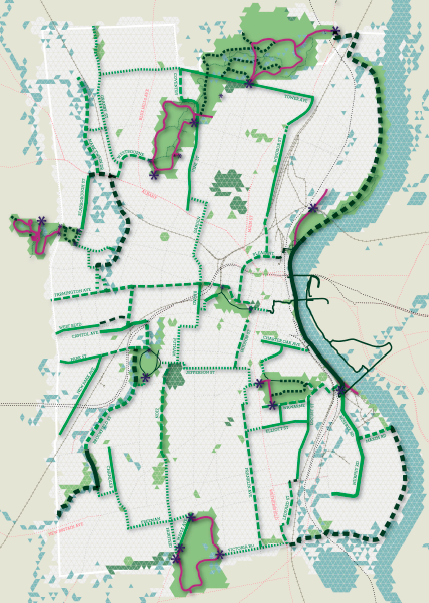 From the Capital City Parks Master Plan, City of Hartford, 2014. My name is ______________________ and I live in the ____________ neighborhood of Hartford [or other town]. 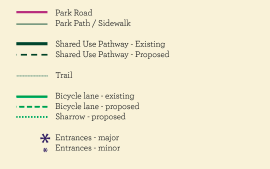 I'm writing to call on you to implement the Capital City Parks Master Plan and its bike routes. I'm writing to encourage you to make the capital funds available to implement the plan, and in the meantime to ask the Department of Public Works to incorporate the bike route striping and markings from the plan into its ongoing milling and repaving work in the city, as we've seen them do on Brookfield St and Main St this summer. Ultimately, implementing the full Master Plan is vital to enabling Hartford residents to bike between all of our parks safely and enjoyably. The Master Plan's proposal for a dedicated, off-street bike path at Albany Ave and Scarborough Street, for instance, is a much-needed improvement to what is currently a very dangerous link between between Elizabeth and Keney Parks.